Sponsor The Whole Show, The series! Sponsor the whole show? Well many of us remember back in the day “Mutual of Omaha’s Wild Kingdom” that kept millions of us kids glued to the tube. 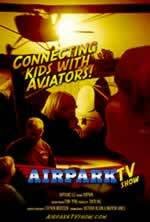 Airpark TV with it’s family oriented approach, the fun, the learning, and kids, is the type of show that might be perfect for a company to sponsor. Whether you sell insurance or donuts, to chicken sandwiches, or are an airline, or even fuel provider, the good wholesome nature of this show, with a family appeal could be a great thing to have your brand associated with. With the way consumers are able to skip the spots, get their programming on demand, advertisers have been trying to figure out ways to get those commercials in. For a company that sponsored the whole show, all of the ad space as well as bugs throughout the programming could be had. So, while we certainly are trying to raise the money via crowdfunding, we are also open to hearing from you about sponsoring the whole show, parts of the show. It worked for the insurance companies, many companies are turning to “branded entertainment”, but a show like this, could be just the ticket. Get in touch right away with the handy email form below! There is no question that Hollywood, and the television industry is inundating our youth with programming that in essence is them pushing a non-traditional family agenda. The traditional family, traditional American values, even basic goodness is under attack. It’s not about entertainment anymore, it’s about using the TV to promote all sorts of agendas that are destructive to families, the economy, and basic decency. Taking on the big players and working to creating family friendly wholesome entertainment and learning for kids is just one of our goals. Certainly we can’t change the world, but we can try and do what we can to make a difference, and with your help we can. While the DVD, the shirt and other perks are nice, there truly are really some long term impactful benefits for our contributors. For Families: Healthy Family and Productive Entertainment for Youth. What’s it worth to you to help create decent family programming for your children? Is your child stuck on the computer, engaging with texting instead of real people and real activities? For those who believe the traditional family, and children engaging in activities that give them life long skills, sponsoring Airpark TV can help us offset Hollywood and make wholesome, good ,clean, fun, & entertaining media a reality. We seek to provide an alternative to the onslaught of programs that may not be what you want your children watching. It doesn’t take very long to figure out the agenda’s that Hollywood is obsessed with pushing on our youth. Helping us fight back with good clean family programming can perhaps start a trend. One look at the spark in the kid’s eyes after they take their first flight or are engaged in an aviation activity and you’ll see why we hope to do this show. For Aviation Businesses & Outreach Programs: What if a television show could help you attract more youth into aviation? Would not those organizations see and increase in interest? Wouldn’t those also be the same that would be using goods and services and fuel that companies make. It’s no secret that the aviation industry is facing a labor shortage. The youth are just not getting the exposure they used to. While there are a number of outreach programs, there isn’t a media source that is attracting more youth. Airpark TV hopes to bridge that gap, complementing existing efforts, and help to spark interest in today’s youth, and try and get them off their electronics and engage with the real world. For Aviation Industry Suppliers, Manufacturers: Airpark TV will help provide a flow of young interested youth into the youth outreach programs, some of which some will end up in aviation, buying fuel, flying planes, fixing aircraft. Showing support for children goes a long way for companies that wish to show their giving back to community efforts. Additionally, manufacturers and GenAv service providers will be helping to sustain and even build more consumers for tomorrow’s GenAv market. For Youth Product Manufacture’s, RC Hobby Industries: This again is another natural. If our show can get going, opportunities to feature and even help promote or sell products via the show are tremendous. If the show gets going, there would be great ways to co-op your products with features, offer kits via the website, even advertise. For Airlines, Marketing & CSR: This is a no brainer. By sponsoring good clean family entertainment about the aviation industry and helping to inspire youth that will become your future workforce, you just can’t go wrong. The goodwill generated by sponsoring a program that is healthy, entertaining and educational for youth can be tremendous. If this show “gets off the ground” as a series or long term digital download, there will be plenty of new, and rewarding opportunities for marketing. For Other Companies & Individuals: The fact that Airpark TV production is reaching out to youth and families & helping them bring something good to our society, inspire kids about aviation and their studies, makes it a perfect effort to help fund.